It was summer (ages ago) when got this uneven skin tone from swimming and other outdoor activities and it really freaked me out! I badly needed a lotion that would even out my skin tone and I don't know what to use anymore since there are lots of lotions that are stocked in the supermarket nowadays all claiming for the same benefits such as protecting, whitening, moisturizing, reducing aging, etc. And if you're like me, you'll probably think, which is the best for my skin? And yeah, you will never know unless you have tried them all! I've tried so many lotions before such as Silka, Belo, Olay, Dove, etc. That summer, I was using Myra E (the red one), though it really smooth-en the texture of my skin, it didn't help in making my tone even. So it had been a problem of mine since then. 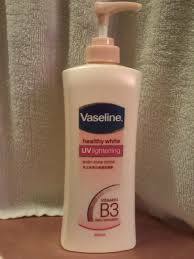 And just recently, my mom did bought me this Vaseline Healthy White UV Lightening Lotion which is what I am going to review today. Helps match your dark skin areas to tour lighter ones. -The packaging. It comes in pink or peach plastic packaging with a pump-like (i don't know what to call it) for better application. -The formula. It has Vitamin B3 which is known to help for the improvement of skin moisturization, appearance of aging skin, and evens out skin tone. It has Triple Sunscreen as well to further protect your skin from harmful UV rays. It does not contain any harmful chemical as well. -The texture. It's very light and creamy, although it does not dry fast enough. -The price. You can avail this for less than 150php in watsons, sm supe, rmarkets, and other drugstores nationwide. I apply this twice a day. As for the 'matching' part, I have seen effects while using this product. I don't know if I should give the credits to this lotion for the brightening effects or to the soap I am currently using (I'm using Kojic soap). Nonetheless, they are a good combination that helps lighten my skin effectively in just three weeks! I am not really an outdoorsy person or someone who travels during vacation so that really helps a lot, I think, since using Kojic soap may increase the skin's sensitivity to the sun. I still don't achieve my dream skin tone yet, but I know, it's gonna be soon! Comments/ Subscribe/ Follow if you have time! Happy blogging!